How about some summertime snacks today? Cut the crusts off the bread. Flatten the bread with a rolling pin. (The children just like to "smush" it with their hand.) Spread on your sandwich filling. Roll up tightly like a jelly roll. Wrap in a piece of plastic wrap. 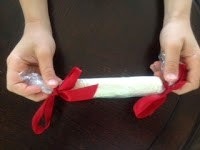 Twist the ends of the plastic wrap and tie with a piece of ribbon. It will look like a firecracker! (Place the pudding mix in the plastic container before starting this activity.) Ask the children if they've ever had mud pies. Tell them you have and they're delicious. Show them the container and explain that it's dirt. Pass it around and let them smell it. (Be cool and don't let on!) Build vocabulary by talking about how dry the dirt is. 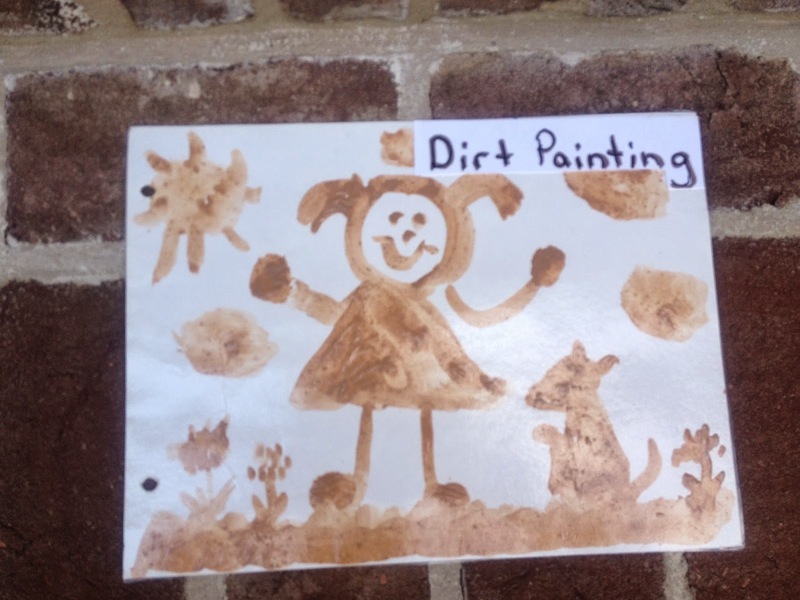 What's the difference between dirt and mud? Suggest adding a liquid and pour in the two cups milk. Seal tightly, then pass the container around the group, encouraging each child to "shake, shake, shake." Open it up and have the children describe what happened. Serve in the ice cream cones. Adaptations: Add seeds (sunflowers) and a worm (gummy worm). *If you can find pistachio pudding you can make alligator pie. Mix all the ingredients together and serve in an ice cream cone. Yippee ti yi yo! No mess because you can just eat the cone when you’re through with the mix. *Use cheese crackers, sunflower seeds, M&Ms, or other dry cereals in your trail mix. Take a stalk of celery (the log). Spread peanut butter (mud) in the celery. Place raisins (ants) on top of the peanut butter. March the ants into you mouth! MMMM! Pour the milk, sugar, and chocolate in the sandwich bag and zip. Place that bag in the larger bag, and then fill with ice. Sprinkle on the salt and zip shut. Throw the bag up and down for about 10 minutes until it starts to harden. *Wear mittens or gloves to keep your hands warm. *You can also make homemade ice cream with a small and a large coffee can. Fill the smaller can with the ice cream mixture. Place it in the larger can and pack with ice and salt. Children can “kick the can” until it freezes. Stir the pudding mix and milk until well blended. Fill cups half full with the pudding mixture. Put a marshmallow on the end of the popsicle sticks, then insert them in the cups. Cover with foil to keep the marshmallows down. Freeze and enjoy! *For healthier frozen treats, freeze fruit juice, yogurt, or smoothies. Add a few drops of blue food coloring to the cream cheese. Let the children spread the cream cheese on one half of a bagel. Decorate with 4 or 5 fish crackers. Summer’s the perfect time for getting messy and being creative! *Give children a pan of water and an egg beater. (Most children have never seen one of these before except in books!) Add a squirt of detergent to the water and let them "beat" up some bubbles. Have children bring their washable dolls to school. Fill tubs with water and soap, then have a bathing party. Add sponges, wash clothes, and squirt bottles. Let children construct boats from two toilet paper rolls stapled together. Glue a triangular piece of construction paper to a craft stick and stick it between the rolls to make a sail. *Mold boats from aluminum foil. *Give children recycled materials (trash and scraps) to use to create boats and things that float. 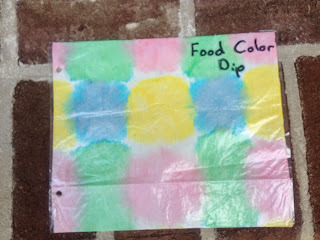 (My kids loved making these, although it might be difficult to find film containers now.) Using a hammer and nail, make a hole in the bottom of a film container and in the lid. Cut a piece of cord or string that can easily go over the child’s head and thread it through the holes. Decorate with stickers and markers. Put a band-aid, the child’s name and address, a piece of gum, etc. inside. Cut a moon shape from a paper plate. Decorate with markers or crayons. Punch holes in the ends and tie on string so you can tie it around the head. Let children collect objects with different textures on the playground. Remove the paper from several crayons. Place paper over the objects and then rung gently with the side of the crayon. 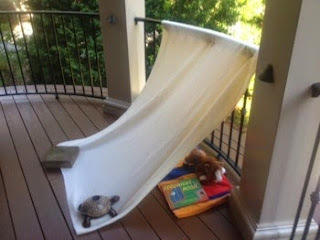 Tents are fun to build, hide in, read a book, or play in with a friend. Drape a blanket over a card table or picnic table. Spread a sleeping bag on the ground for a cozy retreat. Pin one end of a blanket to the railing of a deck or porch. Pull out the opposite end and secure at an angle with bricks or rocks. This is a "cool" place for a game or nap from the summer sun. 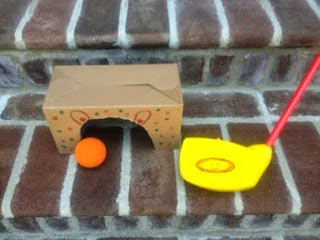 Here's another cool project you can do with a cardboard box. Cut the top and bottom out of an appliance box and place it on its side so it looks like a tunnel. Cut the bottom off of a large plastic garbage bag. Cut up the seam on one side to open the bag. Cut 2" strips up from the bottom of the bag stopping 3 inches from the top of the bag. Tape the garbage bag to the top of the box to create the swishers, then let the children ride their toys through the box. Do you have an old suitcase in the attic or basement? Find some old shoes, hats, jewelry, nightgowns, or other old clothes and let the children play dress-up. How about some outdoor art activities? These activities can be adapted for field day, a beach party, or summer camp. Directions: Tape a large sheet of butcher paper to a fence. Put a small amount of paint on a paper plate. 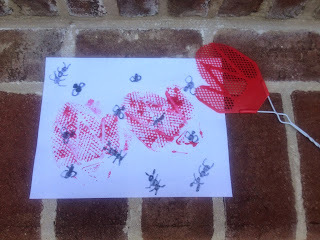 Let children dip a fly swatter in paint and then “swat” it on the paper. Enough academics!! Time to go outside and PLAY! Here are some great ideas to get kids moving this summer. Draw a path on the sidewalk with chalk. Children take balls and try to bounce them on the designated line. You will need several empty cardboard containers from fried chicken, popcorn, ice cream, etc. Turn the containers upside down and cut an arch out of the bottom similar to a mouse hole. Set the containers up on the grass and let the children practice hitting golf balls in the holes. It is right and it is good to take a moment today and discuss Memorial Day and what it means. 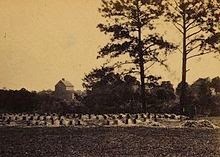 If I didn’t write this blog I wouldn’t know that Memorial Day is not to be confused with Veterans Day. Memorial Day is a day for remembering the men and women who died while serving, and Veterans Day celebrates all U.S. military veterans. READY, SET - READING RECIPES! 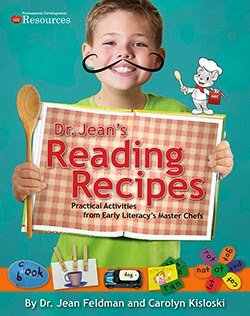 This should be called Carolyn Kisloski's "Reading Recipes" instead of Dr. Jean's because she contributed the most to this book. If you've been to Carolyn's blog (Kindergarten: Holding Hands and Sticking Together http://ckisloski.blogspot.com/) you already know how talented and refreshing her ideas are. I just feel so blessed to have met her and had the opportunity to collaborate with her on this project. The photographs Carolyn took of the children in her class are "proof of the pudding." 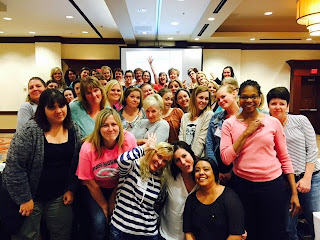 Yes, you can take your standards and turn them into activities children enjoy doing! Our editor, Tom Schiele, is a master producer - like a nice Gordon Ramsey. We are so pleased with the way he fused our ideas and has created a culinary buffet. Here's a link where you can check it out. Summertime isn’t official until June 21st, but if you ask me Memorial Day should be the first day of summer. Summer always brings lots of fresh fruits and veggies, and it’s time to start grillin’! If you’re looking for ideas for your classroom today, you need to turn off your computer and PLAY! Come back tomorrow for teacher talk, but today I'd like to share some of my favorite summer recipes. 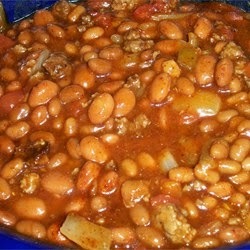 These are good for a cook out, potluck, or a family treat. Around holidays I like to remember what most nutritionists advocate: ALL THINGS IN MODERATION! Splurge a little this weekend and then get back to the rabbit food on Tuesday. P.S. I LOVE to try out new recipes, so if you have a favorite summer dish please send it to me. Preheat oven to 350. Bring a large pot of water to boil over high heat. Season with salt (til’ it tastes like sea water). Add the pasta and cook until just tender - about 12 minutes. Drain well in a colander without rinsing. Transfer pasta to a large bowl. Add half the cheddar, Monterey Jack, and Parmesan, reserving the remaining half of the cheeses for the top. Add heavy cream and stir to combine. Taste and adjust for seasoning with salt and pepper. 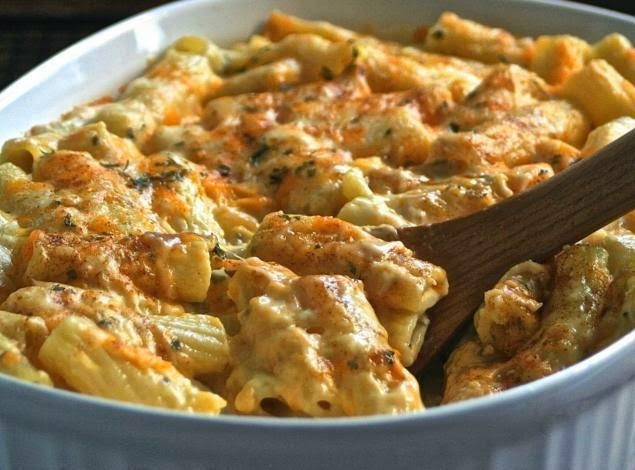 Transfer the noodle mixture to a medium gratin dish or casserole. Sprinkle remaining cheddar, Monterey Jack, and Parmesan on top. Bake until bubbly and golden brown, 30 – 45 minutes. Bake a deep dish pie crust at 350 for 6-7 minutes. Mix ingredients together. Pour into the pie crust. Bake about 30 minutes. Mix all together. Bake at 350 for an hour or for 6-7 hours in a crock pot. 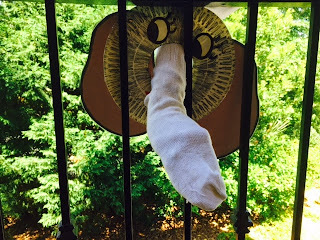 Here’s a simple puppet you can make or the children could bring an old sock from home and make their own. This project ties in well with HORTON HEARS A WHO or SEVEN BLIND MICE. Directions: Cut 2 ears out of gray construction paper. Cut a circle large enough for your hand out of the middle of the paper plate. (Color the plate gray if you desire.) Draw a face on the plate as shown. Attach the 2 ears to the sides of the plate with brad fasteners. 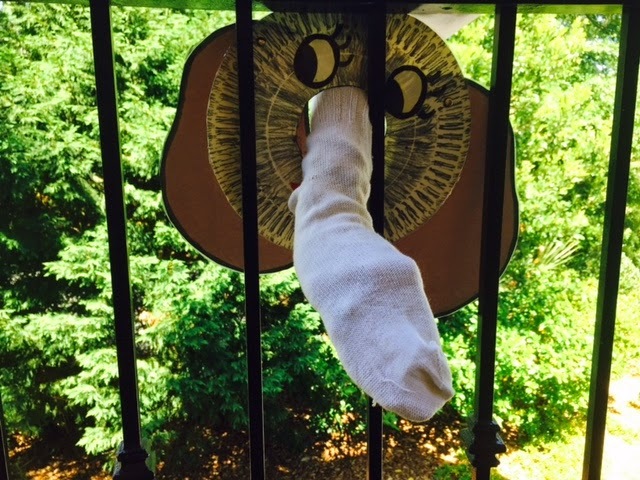 Insert your hand in the sock, and then stick the sock through the back of the plate to create the elephant's nose. But, goodness, gracious, what a nose! It’s almost summer, and that means the planes will be full of some happy children, some screaming children, some bored children, and some entertained children! I’m writing this blog in hopes that teachers can share these ideas with families of children they teach. You can put this on your class website, blog, or send it home with a summer fun packet. An ounce of prevention is worth a pound of cure when you travel with children. And if you’ll read these tips, I bet your fellow passengers will thank you for being on top of the game! Take advantage of the one-on-one time with your child by giving them 100% of your attention. After all, isn’t family time the best part of any vacation? Note! I did not suggest a computer or IPad. Parents, you can pack this in your bag and save it for emergencies. Too often children play with these while waiting for their flights to take off and then they are bored by the time they get on the plane. Once you are in the air, it’s time to open the backpack and read some books, play a game, draw some pictures, or eat a snack. If a beverage is served, show your child how to put down their tray and discuss their selection. Keep on talking and engaging your child. parents to let their child select a strip each day and do the activity. Hint! You can also use a plastic sand bucket or seasonal cup for this project. You can also send home a summer calendar children will enjoy doing with their parents. Here's a link where you can download the summer activities and calendar. Make the last few days “sweet” ones to remember with lots of special days. You might want to celebrate “Wonderful Wednesdays” the last month of the school year or plan a little celebration every day the last week of school. What many adults forget is that children are happy with “plain vanilla.” Wearing a silly hat or a shirt from a favorite sports team can be as much fun as a fancy ball! Sports Day – Enjoy the warm weather with a “Sports Day.” Children can wear t-shirts and hats from their favorite teams. Let them bring sports equipment to share with friends on the playground. 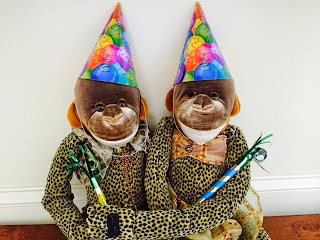 Book Party – Encourage children to dress up like their favorite book character. Play “Guess Who I Am?” or have children describe why they like a particular character. Let them bring favorite reading material (books, magazines) from home and sit or lay wherever they want for independent reading. Talent Show - One of my favorite memories is of a Talent Show we had at the end of the school year. I just invited all the children to think of a “talent” (song, dance, story, gymnastic stunt) they could do. We sat in a circle and they all got up and performed! We clapped and laughed and cheered! Board Game Day – Let children bring board games from home. Set aside the last hour in the day to share games and play with friends. Pajama Party – Have children wear pajamas and bring pillows and stuffed animals to class. Read books, watch a movie, and eat popcorn. Career Day – Children come dressed for the career they’d like when they grow up. 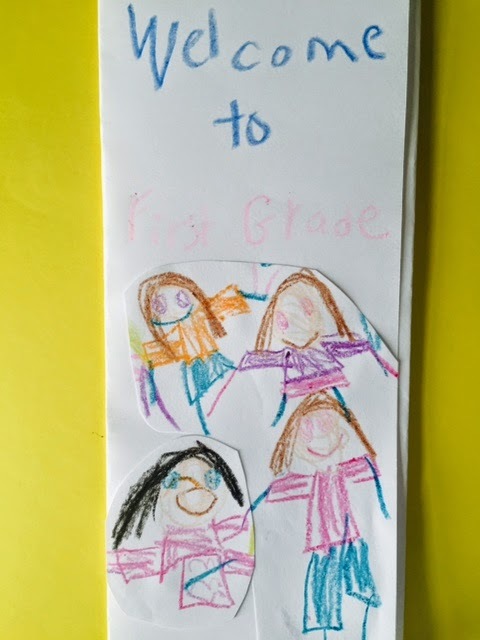 After sharing with friends, have each child draw a picture (or take a photograph) and make a class book. Beach Party – Bring beach towels and wear sunglasses, shorts, and bathing suits. Set up sprinklers or other water activities on the playground. Play beach ball games, beach music, and have a “cool” snack like popsicles. Teddy Bear Parade – Children bring in a teddy bear or stuffed animal and parade around the classroom. Have them write stories and draw pictures of what they like to do with their bear. Have a “tea party” with your bears. Hat Day – Ask children to wear their favorite hat to school, or challenge them to design a hat from a paper plate and art scraps. Luau – Make grass skirts from draw string garbage bags. Cut straws in 1” pieces and alternate stringing with paper flowers on dental floss to create a lei. Hula, surf, and eat pineapple fruit kabobs for snack. Toy Day – Children bring a favorite toy from home and share with their friends. Sock Hop – Children get to wear silly socks to school and have a dance at the end of the day. *Teach the children the “Twist,” “Charleston,” “Jitterbug,” “Swim,” “Pony,” or other dances from your past. Teacher of the Day – Assign one child each day the last month of school to be “Teacher of the Day.” That child gets to sit in your desk and be in charge of circle time. 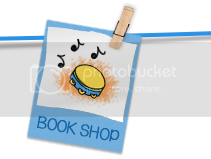 They can choose a book to read to the class, a song to sing, game to play, and so forth. 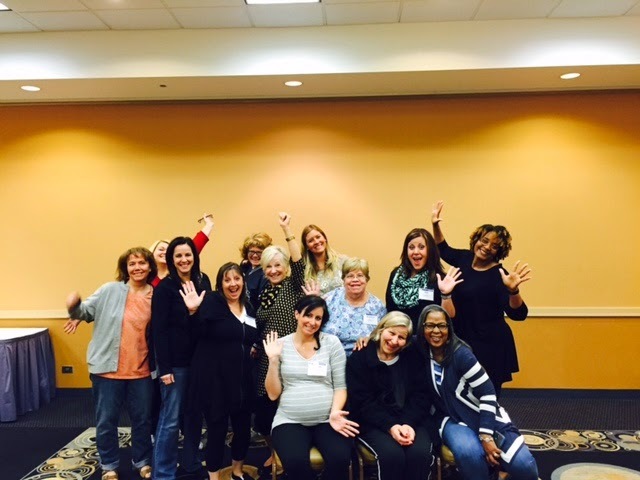 We ended our seminar last week with some awesome ideas. Take a look, and I bet you’ll find something quick and meaningful you can use this week! This “show me” game can be used for math facts 1-10. The teacher says a number like “5” and holds up one finger. The other children show 4 fingers. The teacher can easily see who knows the facts. 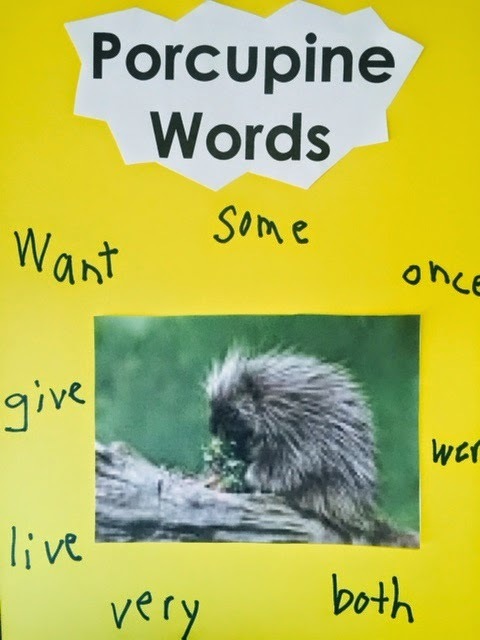 Students collect “porcupine words” that are prickly, sticky, and hard to pronounce. 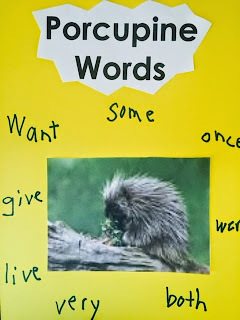 Make porcupine folders (folder with colored porcupine on it) so children can write the words. During reading group the students follow along as you read. When it’s their turn they get a point for the “kids” if they keep up. If they don’t keep up the “teacher” gets a point. Pass out badges that say “Ask me! 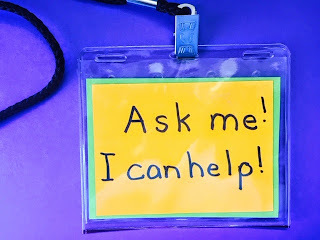 I can help!” for students to wear during independent work. Students must go to “ask me” friends before coming to the teacher. This empowers low level students and it’s good for high level students to explain concepts. Use a tap light for children to develop self-regulation. When the light is on no blurting out or telling stories is allowed. When the light is off the students can talk off topic or tell a story. 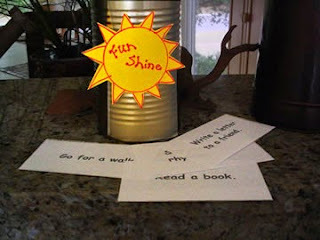 Here’s a great game for a literacy brain break. Write sight words on small, yellow pieces of paper and crumple them up to look like popcorn. Store these in a popcorn container from the dollar store. 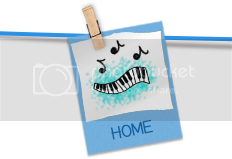 Play music and encourage creative dancing/movement. Stop the music and the children have to freeze. Children who are totally frozen get to pick up a piece of popcorn and read the word. After several children have had a turn put the music back on. The star student gets to bring in a mystery object. The rest of the class can ask 20 questions to try and guess what the mystery object is. Each child has a baby food jar that is their savings account. They can earn plastic coins and save them in their jars. They can use the money to buy prizes or they can use them at a bake sale. 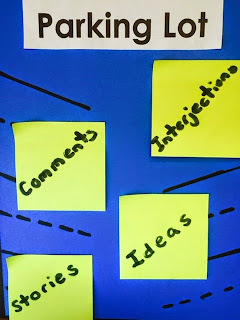 Use picture/word charts around the room for students to practice asking questions. Students take turns asking questions and the answer has to be on a picture/word chart in the room. My love for you would fill ten pots, fifteen buckets, sixteen cans, three teacups, and four dishpans. This idea works for students who finish first or have behavioral issues. Fill several small baskets with magnetic letters, numbers, color blocks, etc. Students can put the letters in order, numbers in order, or reproduce a block pattern. This will keep them engaged until you are ready to do the next activity. Yeah, I know you’re counting the days until school is over, but the new school year will be here before you know it. These are some projects you can do now and save for later. 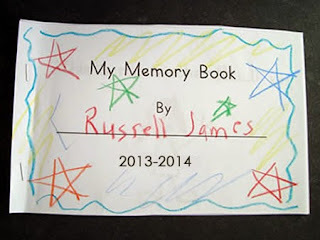 Invite children to recall some of their favorite memories from the school year. Give them a sheet of paper to illustrate it. Ask them to write (or dictate) a sentence about it. Put their pictures together in a cover that says, “The Best Thing About (Grade)” and bind. Save the book to read to your new class when school starts. 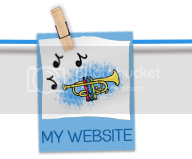 Demonstrate how to fold a sheet of paper into thirds to make a brochure. 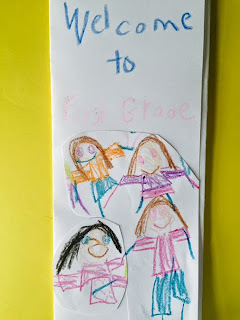 Let each child create a brochure called “Welcome to Grade.” They could include things they’ll learn, special events, etc. Save these and give them (or send in the mail) to your upcoming students when school starts. Have your children create a bulletin board to welcome the new class. Cover with newspaper to protect over the summer, and you’ll be ahead of the game when school starts. How about one of these themes? What better gift can you give your students at the end of the year than a library card? 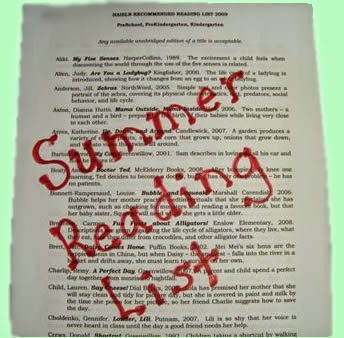 Take a field trip to your local library or ask the children’s librarian to visit your school and describe all their summer reading activities. It’s easy to do an internet search and find a suggested reading list for your grade level. Parents would probably appreciate this when helping their child choose books to read over the summer. Cut cardstock the size of a postcard. Let children decorate one side with markers or crayons. On the reverse side draw a line down the middle. Have the children write the teacher’s name on one half. Explain that if they send you the postcard over the summer and write you a note that you will write back to them. *You could also give the children a pre-stamped envelope addressed to you. Explain that whenever they write you, you will write them back. What to do with all those books your class has created over the year? Number the books and have a raffle. 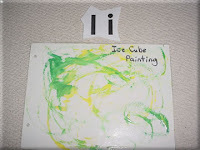 Put similar numbers in a “hat” and let each child draw one. 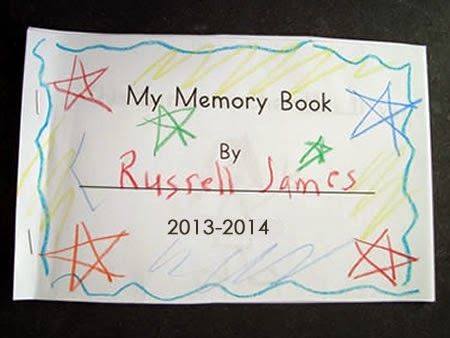 They’ll each go home with a book to help them remember their friends. *Send these home in your “end of year” letter to parents. *Fold these up like paper airplanes and send them flying on the playground. 1st page – “My Memory Book” with teacher’s name, school, year. 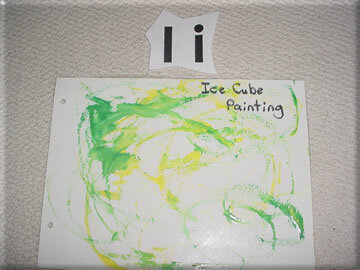 You could also have children draw their favorite sport, color, book, song, food, etc. *If you do an end of year conference with parents this would be a good thing to share. Cut paper in fourths. (I like to use colored paper.) Have children count out 10 pieces. Hole punch and tie with a ribbon. Children walk around the room and get their friends’ autographs. Hint! You could also let them collect their friends’ phone numbers (with parental approval). Brainstorm all the things your students have learned during the school year. Give each child a sheet of paper and have them draw something they couldn’t do at the beginning of the year that they can do now. Complete this sentence: “I couldn’t _______, but now I can _______.” Make a cover that says “Now I Can!” and bind to make a book. A teacher in New York shared this idea with me years ago. It’s going to take a little work, but it will be something children will treasure the rest of their lives! 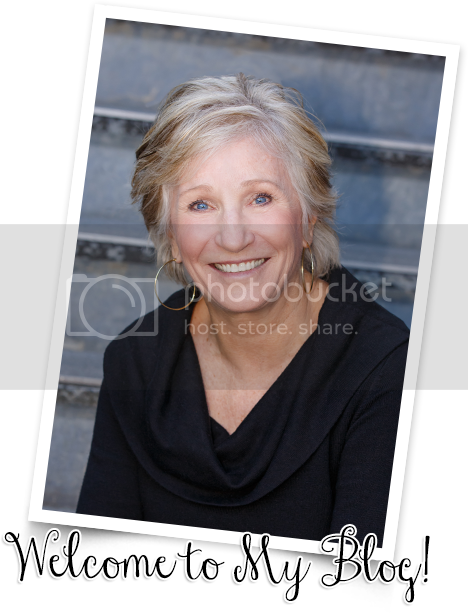 You will need to assemble photographs of the children, as well as pictures you’ve taken throughout the school year. Take 26 sheets of paper and write a letter on each page. Glue pictures of the children on the page their name begins with. Next, sort through the pictures and glue them on appropriate pages. (I’ve give you some suggestions for each letter below.) 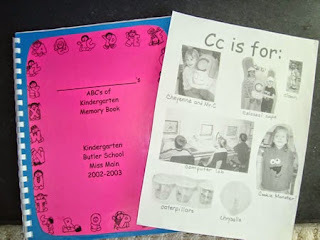 Label the pictures and run off a copy for each child. Use cardstock for the front and back cover and bind. *Use the name of the school, teacher’s name, etc. Hint! If you don’t have photographs, have your children draw pictures for your book. 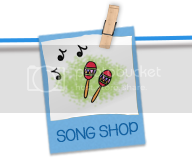 *Make a video of your students singing, working in centers, and doing other things they like best at school. 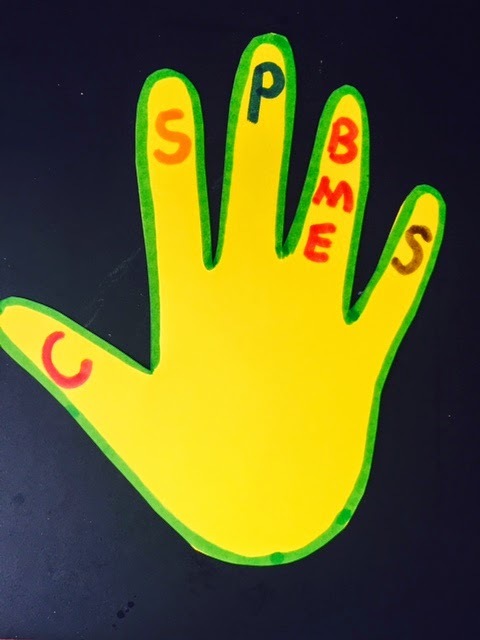 These projects will give children a tangible way to remember their friends. Have children bring in an old t-shirt from home. (White works best.) 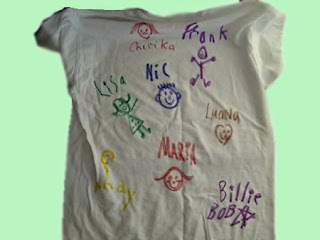 Provide them with fabric pens and let them have friends write their names and draw pictures on their shirts. Hint! Plan several days for this project. It’s “no fun” if you have to do it all at once. 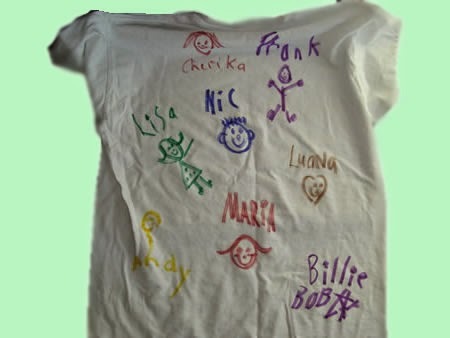 Let children bring in a pillowcase and have their friends decorate them with their names and pictures. They will have “sweet dreams” all summer! 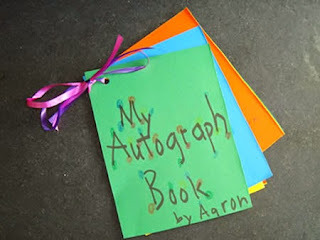 You will need construction paper, yarn, markers, and hole punches for this project. Cut the construction paper into 2 ½” squares, circles or other simple shapes. Each child will need as many pieces as there are students in your room. Have them write their name and draw pictures on their shapes. Punch holes. Now comes the fun part! Children get to go around the room and give a shape to each of their friends. Encourage them to say something kind they remember about their friend as they pass them out. 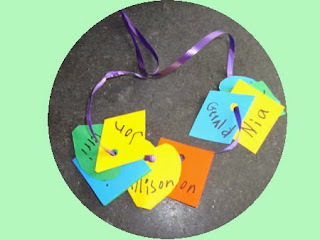 Finally, children string the shapes on yarn and knot the ends to make a necklace. 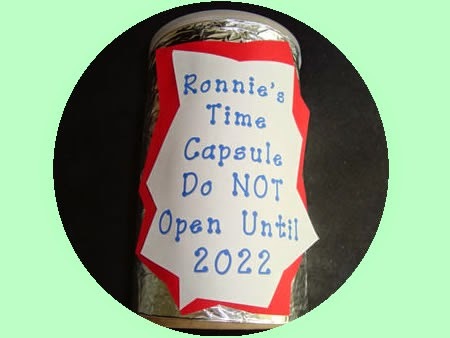 Create a memento of the year with a time capsule. Ask each child to bring in Pringle’s can. 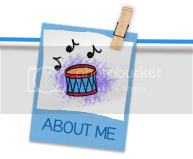 Have them draw a picture of themselves and put it in the can. Let them write or dictate what they want to be when they grow up and illustrate it. Challenge them to collect a wrapper from their favorite food, something their favorite color, friends’ signatures, and other small, meaningful objects to add to their bottles. After gluing on the lid and decorating the outside, send the time capsules home with a note to the parents asking them to save them until their child graduates from high school. Have students make two lines facing each other. They should stand 2-3 feet apart. Demonstrate how to move your palms in a circular direction like a car wash. Choose one child at a time to walk “through” the car wash. Students should gently pat the friend going through the car wash as they make positive comments about that friend. Are you scratching your head trying to figure out where the school year went? Some of you only have a few more days, but many of you have several weeks to go. You know, the end of the year is like dessert. If the meal isn’t very good, the sweet dessert can make up for it. This week I’ll share some ideas to put a “sweet memory” to give all of your students. School is coming to an end. Say so long to all our friends. (Number of days) left in the school year. (Number of days) left, that’s so. We’ve had fun, we’re almost done. (Number of days) to go. 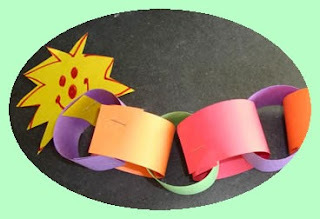 Let each child make a paper chain with the number of days left in the school year. Each day they can remove one strip. 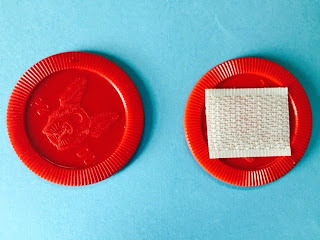 Put a piece of Velcro on a poker chip for children to keep in their pocket. They can rub the Velcro on the chip to calm down. If I’m late my teacher won’t wait. Children can signal that they need a tissue by touching their finger to their nose. firstbook.org has books for teachers and students at low-income schools. Make a wall poster similar to the one shown. After reading a story students grab each digit and retell the information. Oh, my paper has my first name. It’s right there at the top. Or in the trash it’ll plop. S – P – E – C – I – A – L! Teach children to say “N.A.P.” when they make a mistake or bad things happen. Write numbers 1-20 on flooring square tiles and use them for various counting, addition/subtraction, number stories, etc. When kids don’t know a word during a story they put their “word wizard” (twirl two fingers in the air) up. The teacher can ask them what they have a question about when you get to the end of the page. *Write flash cards with highlighters and use with a black light. Teachers dress up in lab coats, wigs, and goggles, and use a funny voice to teach science and do experiments. Teach children signs for white and chocolate milk, as well as specials like art, music, PE, etc. When you’re quiet we will go. Off to (music) we will go. My sentence needs a check. Hi ho a writing I go. *Pointer says it makes sense. Pointer says it makes sense. Read it and then you’ll say.